Want to know what those mysterious terms mean and just who the people were behind those names? Then this is the place for you. The Dictionary of the Fuchsia started out as a glossary to help with the unfamiliar, as well as the familiar. While I've been dealing with calyxes and corollas long enough, it occurred to me that many visitors to the website, especially those new to fuchsias, might appreciate a clue. Over time, more and more definitions, as well as important entries such as short biographies, were added as I kept realizing other things and places and people fuchsia that begged to be included. The fuchsia world may not date back to the ancient Greeks or Egyptians but it's still managed to become a wide and interesting one since its first flowering in the Ages of Exploration and Reason. At some point, I had to admit that the entries were simply bursting out of the glossary format and the Dictionary of the Fuchsia was born. I hope you find it helpful. Botanical Latin terms, as used in species epithets, are given in the grammatical form appropriate to Fuchsia. For much additional information, also see the ➤ Site guide. Raceme – An often terminal flower cluster borne at the ends of branches in which the individual blossoms are arranged tightly on short stalks along a rachis, or central stem. Fuchsia boliviana (illustrated at the right) is an example of a raceme in fuchsias. Racemosa – With flower clusters held in racemes (see previous). Fuchsia racemosa (Lam. 1788) is a synonym of Fuchsia triphylla in ➤ Section Fuchsia. Fuchsia racemosa (Sessé & Moç. 1888) is illegitimate, as well, and a synonym of Fuchsia fulgens in ➤ Section Ellobium. Rachis – The main or central axis of a compound structure. It can be the main stem of a compound leaf or of a compound inflorescence, such as a panicle or raceme, as found in some fuchsia species. Radicans – Having roots shooting from the stems. F.uchsia radicans (Miers 1841) is a synonym of Fuchsia regia subsp. serrae in ➤ Section Quelusia. Ramiflory – The production of flowers on the branches of a plant. The corresponding condition of flowers on the trunk is termed cauliflory. Rank – Rank is the level, or relative position, in a taxonomic hierarchy. The main ranks in botany are domain (regio in Latin), kingdom (regnum), division (divisio), class (classis), order (ordo), family (familia), genus (genus) and species (species). Raven, Peter (b. 1936) – Raven (b. 1936) was director of the Missouri Botanical Garden from 1971-2011. 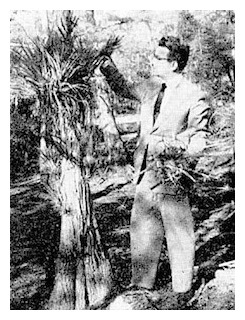 In 2000, the American Society of Plant Taxonomists established the Peter Raven Award for authors who have made outstanding contributions to plant taxonomy. See Fuchsia ravenii in ➤ Section Encliandra. Ravenii – Named in honor of Peter H. Raven (b. 1936) See: Raven; Fuchsia ravenii in ➤ Section Encliandra. Recurvata – Bent backwards. Fuchsia recurvata (Niven ex Hook. 1836) is a synonym of Fuchsia magellanica Lam. in ➤ Section Quelusia. Recipes – All fuchsias are non-toxic and edible. A number of recipes for jellies and jams, or even puddings, can be found on the internet. For example, ➤ Fuchsia Recipes. Not having tested many of these particular recipes itself, this Dictionary makes no endorsement regarding outcome or taste. They’re usually just gobbled down fresh at Fuchsias in the City. See also Berries, Edibility. Red Spider Mite – Tetranychus urticae. These minute pests usually only flourish in the hot and dry conditions fuchsias dislike. Problems are most likely to occur when overwintering plants inside the greenhouse, or under lights, but can also happen outside in hot, dry positions in the summer. Increasing protection from the sun and adding additional, cooler humidity generally helps reestablish conditions which are unfavorable to the mites. Severe infestations will quickly defoliate a plant so additional organic or chemical controls might be needed. Reflexed – Bent or turned downward. Regia – Royal or kingly. See Fuchsia regia in ➤ Section Quelusia, of which there are three subspecies. Reiter, Victor, Jr. (1903-1986) – Renowned American nurseryman, horticulturalist and hybridizer of fuchsias, among many other plants, who operated La Rochette Nursery in San Francisco, California. Reiter help found the California Horticultural Society in 1933 from a group of local growers and gardeners who came together to compare notes after a freak freeze decimated plants in the area. During the Thirties, he developed the nursery on property behind the house he had purchased on Stanyan Street in 1926, purchasing additional property as it expanded. This famous nursery, which closed in 1963, was an early center for the dispersion of the many new fuchsias emanating from California during this period. Reiter also hosted other hybridizers, such as the well-known Horace Tiret and Clement Schnabel (see both also), as they had no facilities of their own. Reiter, Victor, Sr. (b. Luxemburg 1865 - d. San Francisco 1944). San Francisco, California plantsman and father of Victor Reiter, Jr. (see also). Reitz, Father Raulino (1919-1990) – Born in Antônio Carlos in Santa Catarina State in Brazil, Reitz was both an energetic catholic priest and a noted botanist and local historian who specialized in the flora of southern Brazil, especially the bromeliads of his beloved home state, Santa Catarina. Ordained in 1943, he continued his education and then taught a wide variety of subjects for many years at the seminary in Azambuja, Santa Catarina (1947-1971). He founded and directed the Herbário Barbosa Rodrigues in nearby Itajaí, which he started in his rooms from his specimen collections while he was still at the Seminário Central de São Leopoldo in 1942. The herbarium would find a permanent home in its own building in Itajaí and now holds 42,354 archived specimens of the flora of Santa Catarina and 11,000 from neighboring states. In 1948, he also started the annual publication, Sellowia. Later, he was the director of the Morro do Baú Botanical Park at Ilhota, as well as the director of the Azambuja Museum in Santa Catarina. From 1971-1975, he served as the director the Botanic Garden in Rio de Janeiro, where he was considered one the most active and energetic directors since its founding, and then as the director of the Fundação do Meio Ambiente (FATMA) of Santa Catarina from 1976-1983. 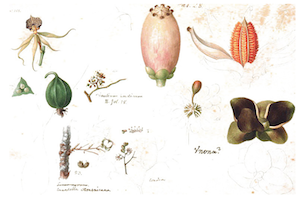 Reitz's botanical magnum opus, however, was certainly the Flora Ilustrada Catarinense. For several decades he covered the province, square kilometer by square kilometer, "by plane, by foot, wagon, jeep, boat, train, ship, motorcycle, bicycle," with or without the promised financial support of the state government. At his death, the encyclopedic work was not quite complete but spread across an astonishing 12,489 pages contained in 149 volumes and included 2,760 prints, 1,983 maps, 149 families, 734 genera, 3,333 species, 237 varieties and 33 forms. See Fuchsia regia ssp reitzii in ➤ Section Quelusia. Reitzii – Named in honor of Father Raulino Reitz (1919-1990). 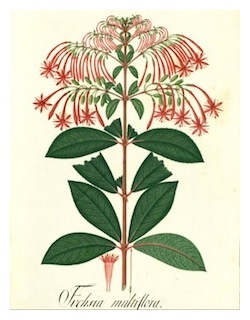 See: Reitz; Fuchsia regia ssp reitzii in ➤ Section Quelusia. Reproductive Systems – Like most plants, most fuchsias have hermaphroditic flowers that are termed perfect (or bisexual) in botany as both their male and female reproductive parts are contained within the same flower. This is different from some monoecious plants which have evolved to have separate staminate (or male) and pistillate (or female) flowers on the same plant. Some fuchsias, especially those in the Encliandra section however, have further evolved to be gynodioescious, where the species population is separated into individuals that have either pistillate female flowers and those that have hermaphroditic ones, or even dioecious, where staminate male and pistillate female flowers occur only on separate plants within the species population. These reproductive systems are important to consider in fuchsia hybridization programs. Respiration – The breakdown of sugar and other food molecules within a cell in which a part of the resultant energy is utilized. When oxygen is utilized during the breakdown, the process is called aerobic respiration. Otherwise, it is anaerobic respiration. Rhizome – A thickened stem, usually running horizontally underground, from which roots and shoots develop at the nodes. Rhizomes are always modified stems and should't be confused with tubers, which are different plant storage structures, and can often be formed from modified roots in addition to modified stems. See also Tuber. Riccartonii – Referring to the village or parish of Riccarton, in East Ayrshire, south of Glasgow in Scotland. Fuchsia riccartonii (Tillery 1871) is a synonym of Fuchsia magellanica Lam. in ➤ Section Quelusia. Fuchsia x magellanica "Riccartonii" is a garden hybrid which apparently originated in the village. 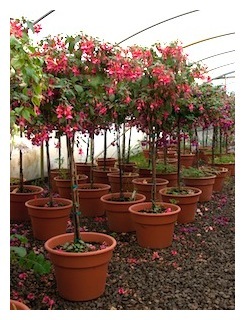 Riverside Nursery National Collection of Fuchsias – See National Collections (UK). Rivularis – Found growing beside streams or brooks. 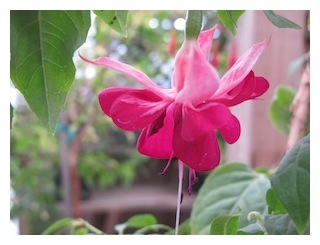 See Fuchsia rivularis (J.F Macbr. 1940) in ➤ Section Fuchsia, which has two subspecies. Robusta – Robust, strong. Fuchsia × robusta (Tengbergen 1855) is an unresolved name. Rosea – Rosy, rose colored. Fuchsia rosea (Ruiz & Pav. 1802) is a synonym of Fuchsia lycioides (Andrews 1800) in ➤ Section Kierschlegeria. 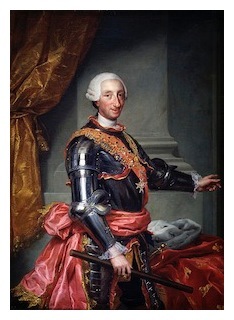 Royal Botanical Expeditions – When the Spanish king, Charles III (1716-1788), who had previously ruled in Italy as the king of Naples and Sicily, ascended the throne of Spain in 1759, he found a country and empire suffering from malaise and decay. He began instituting reforms that sought to weaken the extensive power of the Church and its monasteries and instead promoted universities and academic learning in areas of science and scholarly research, health and medicine, and agriculture. His more enlightened policies also sought to facilitate trade and commerce and he aimed overall at avoiding costly wars that might interfere with the health and well being of his far-flung dominions. Under his reform-minded policies, three major official expeditions to explore the botanical riches of Spanish possessions in the New World were launched. These include the Botanical Expedition to the Viceroyalty of Peru (1779-1788), which would be published in a number of works, and the Royal Botanical Expedition to New Spain (1787-1803), which effort would unfortunately largely languish until the nominal publication of its collections in 1889 and 1891. Both expeditions did, however, result in the discovery of a number of new fuchsia species. The third expedition, the Royal Botanical Expedition to New Granada (1783-1816) lasted well over thirty years and its results remained unpublished in their entirety until 1952 due to the enormous scope and area of the collections. It also managed to collect a number of fuchsia species, though. 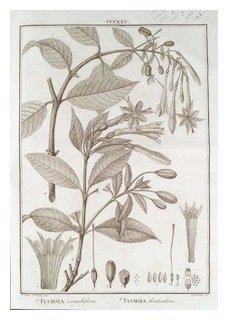 A fourth botanical expedition was led by Juan de Cuéllar to the Philippines (1786–97) and involved no fuchsias. See each American expedition below. Royal Botanical Expedition to the Viceroyalty of New Granada – Real Expedición Botánica al Virreinato de Nueva Granada. 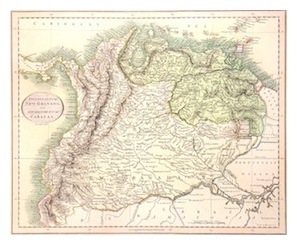 One of the four major expeditions of botanical exploration commissioned by Spain's reformist monarch, Charles III, the Royal Botanical Expedition to New Granada occurred between 1783 and 1816 and covered it territories in present-day Colombia, Ecuador, Panama, Venezuela, part of Peru and northern-western Brazil, and western Guyana. It was led by the Spanish priest, mathematician and botanist, José Celestino Bruno Mutis y Bosio (1732-1808) (see also) until his death, and then by his nephew, Sinforoso Mutis (1773-1822), until it ended in 1816. Mutis had already proposed the expedition in 1763 and again in 1764. He subsequently resisted becoming part of the Royal Botanical Expedition to the Viceroyalty of Peru (1779-1788) with was already being led by Hipólito Ruiz (see both also). His own proposal was not finally accepted until a third request was made to the king on his behalf by Archbishop Antonio Caballero y Góngora (1723-1796), the viceroy of New Granada from 1782-1789. The expedition was formally launched from Mutis's home in Mariquita (Colombia) in 1783. In 1790, the expedition's headquarters were moved to Santa Fe de Bogotá (Bogotá, Colombia), at the capital of New Granada. Mutis immediately recruited a large contingent of experts that included botanists Juan Eloy Valenzuela y Mantilla (1756-1834) and Fray Diego García (1745-1794), geographers Bruno Landete and José Camblor, as well as large group of painters including Pablo Antonio Garcia, Francisco Javier Matiz, Anthonio and Nicholás Cortéz. Vicente Sánchez, Antonio Barrionuevo, and Vicente Silva. Others included the foreman Roque Gutierrez, several collectors and even a messenger. Many other participants were engaged over the expedition's long course, such as the botanists Francisco Antonio Zea and Sinforoso Mutis (his nephew who would lead the project after 1808), the geographer Francisco José de Caldas, the mineralogist Enrique de Umaña, chemist and zoologist Jorge Tadeo Lozano, copyists Francisco Javier Zabaraín and José María Carbonell, and José Antonio Cándamo, who was employed to oversee the expedition's herbarium in Santa Fe de Bogotá. Along with the expedition's regular activities, Mutis also started a free school of drawing and an astronomical observatory in Santa Fe de Bogotá as well. Several smaller expeditions extended the expedition's geographical coverage. One such effort was led by Francisco José de Caldas, who explored the area of present-day Ecuador for four years, before returning to Santa Fe de Bogotá in 1808 with an extensive collection. Another, led by Fray Diego Garcia, explored the upper Magdalena River Valley before reaching Andaquíes (Colombia) and collected numerous animal and geological specimens. Eloy Valenzuela, deputy director of the expedition during its first year, was to have covered Santander Province, but that expedition was cut short due to his poor health. Mutis led the Royal Botanical Expedition for twenty-five years, during which time it probably covered and explored an area that extended over three-thousand square miles (8,000 sq. km). Even before the expedition was approved and launched, Mutis had regular contacts with many prominent European scientists, including Carl Linnaeus. Following the Linnaean system of classification, he developed a meticulous methodology that included collecting specimens in the field together with detailed descriptions, including data about the surrounding environment. 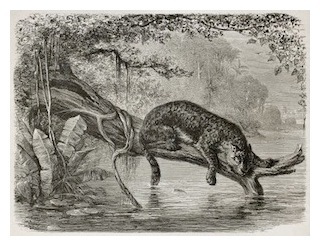 Some six thousand new species would be discovered during the expedition's long course and almost seven thousand drawings, with twenty-thousand additional plates, covering 2,738 different taxa were produced. When Alexander von Humboldt visited with Mutis for over two months during his own expedition to South America in 1801, he would express much admiration for his methods and praise for his botanical collecting. 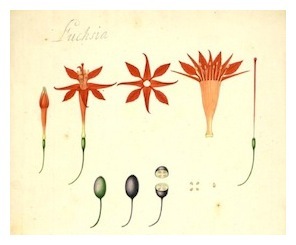 A number of fuchsias, of course, are among the bounty of the expedition's many collections and illustrations. The current identity of many of these plants still needs to be sorted out, though. While the collations between of the expedition's notes and plates were unfortunately lost in a shipwreck, the enormous collections of drawings and plates, maps, correspondences, notes, manuscripts, herbarium specimens and many other related materials are today preserved at the Royal Botanical Garden in Madrid, with a small portion at the Real Academia de la Historia. 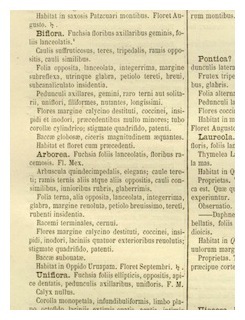 Little was published directly by Multis himself, and much of the expeditions huge body of work remained unedited and unanalyzed, but many of the taxa were published by other well-known botanists starting with Carl Linnaeus to Antonio José Cavanilles (1745-1804) to Alexander von Humboldt and Aimé Bonpland and on to others well into the Twentieth Century. For many decades, however, this historic and important collection was all but forgotten and gathered dust at the Royal Botanic Gardens in Madrid until Ellsworth P. Killip (see also) led a resurgence of interest in the material starting in 1929, when he began studying and reorganizing it. In 1932, the Spanish botanist José Cuatrecasas was sent to Columba as Spain's official representative for the bicentenary of Mutis' birth. 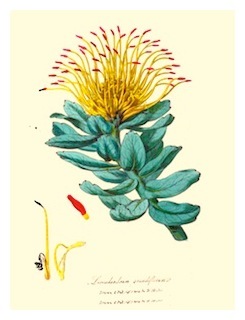 As part of that celebration, Spain and Colombia jointly published the Flora de la Real Expedición Botánica del Nuevo Reino de Granada, released in 1937. In Spain, Cuatrecasas had also begun a publication of Mutis' Flora Americana but that endeavor had to be abandoned when Francisco Franco took control of the country during the Civil War and the politically suspect Cuatrecasas was forced to flee into exile in Paris in 1939. Publication of the expedition's enormous body of work in its entirety was started in 1952, after the interference of the Spanish Civil War and World War II ended, and then restarted again in 1982 after an hiatus. By 2002, the project had published twenty-eight volumes, of a projected fifty, but the huge undertaking seems to have stalled once again since then. 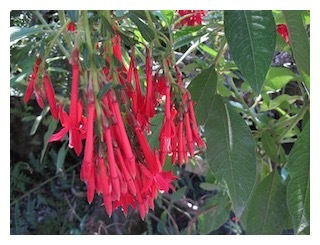 The Onagraceae, which of course is home to the genus Fuchsia, still awaits publication. Royal Botanical Expedition to the Viceroyalty of New Spain – Real Expedición Botánica al Virreinato de Nueva España. When Martín de Sessé y Lacasta (see also), a Spanish military physician and botanist, arrived in New Spain in 1780 to take up duties there, he quickly recognized the enormous botanical potential of the vast and mostly unexplored reaches of the territory. Establishing himself in Mexico City as part of its colonial élite, he began lobbying for the formation of a botanical expedition on the successful model of others that had been undertaken in Spanish territories.He wrote to Casimiro Gómez Ortega, a fellow physician, botanist and first professor at the Royal Botanical Garden in Madrid, to enlist his support. Sessé's proposal had two major aims: The first was to classify the natural resources of the Viceroyalty of New Spain and the second was to implement new health procedures and education in its colonial territories. The two aims eventually convinced the sympathetic and reform-minded Viceroy of New Spain, Juan Vicente de Güemes, the second Conde de Revillagigedo (1740-1799), as well as Charles III who issued a royal decree authorizing the project and providing the necessary funding. In March 1787, the great botanical adventure known as the Royal Botanical Expedition to New Spain was officially established. Sessé was to lead a select team of botanists and scientists, both local and those sent by the director of the Royal Botanical Garden of Madrid, on several important explorations from 1787 to 1803. In order to learn from the experiences of earlier botanical expeditions, Sessé took first trips to Santo Domingo, Puerto Rico, and Cuba. Returning to Mexico, he was joined by the other botanists and scientists that were to form the Royal Botanical Expedition, including Vicente Cervantes, the first professor of botany in New Spain, José Longinos Martínez from the Cabinet of Natural History (the precursor to the Museum of Natural History), Juan Diego del Castillo, a botanist and pharmacist, and José Maldonado, a Mexican botanist and anatomist. 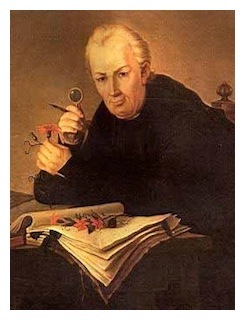 One significant member in particular, José Mariano Mociño (see also), an exceptionally talented Mexican-born botanist and physician who had studied at the University of Mexico, didn't join the team until 1790 but proved himself to be such a capable and exceptional scientist that his work on the Expedition quickly become more of a partnership with Sessé than anything else. Among the members were also a number of painters and illustrators, such as Juan de Dios, Vicente de la Cerda, José Guio, Pedro Oliver and Atanasio Echeverría y Godoy, after whom the genus Echeveria was named. The first two years were spent in the foundation of the Royal Botanical Garden in Mexico City and in the exploration and collection of the areas close by, slowly expanding outwards from there. By 1790, the team was covering larger territories crossing to Michoacán, Sonora, Apatzingan and beyond. At Guadalajara, the group split in two, with Mociño leading one group and Sessé the other, both covering alternate routes to Aguas Calientes. By the time both sides reached their destination in 1792, a royal order had arrived for the Expedition to travel to Nootka Island (part of Vancouver Island in the Pacific Northwest) which area that was then under dispute with Great Britain. 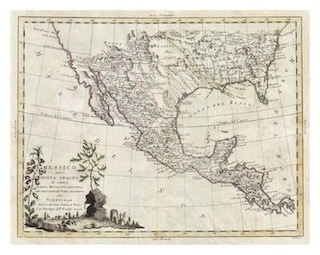 The explorers, except for Juan del Castillo who died in 1793 shortly after having finished describing the plants collected on the way to Acapulco, set out for the far north following the California coast. After Nootka, the Expedition's efforts were focused to the south. Again, there were to be two teams, one lead by Mociño exploring Mixteca and the Tabasco coast, and the other by Sessé covering Jalapa and Guaztuco. Reunited in Córdoba, the Expedition travelled on to Veracruz and then returned to Mexico City by way of Tehuantepec and Tabasco. 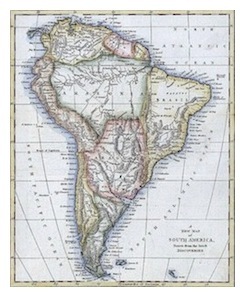 In March 1794, the Expedition's reach was extended to explore in Central America and the Caribbean, specifically Guatemala, Cuba, Santo Domingo and Puerto Rico. The group yet again split into teams. Sessé and Echeverría went to Cuba while Mociño, de la Cerda, del Villar and the others went on to explore Guatemala. Sessé was eventually ordered to conclude the Expedition and return to Spain but it would take him and Mociño two more years to prepare the numerous collections and materials. The pair was finally able to travel to Spain in 1803, where they began to press for the publication of the Expedition. In one of the saddest and most unfortunate outcomes imaginable, political upheavals and the disinterest and apathy of the monarchs who succeeded Charles III would interfere with what should have been a great scientific triumph. While some minor papers resulted, neither Sessé, who died disappointed in 1808, nor Mociño, who died poor and blind in 1820, would ever see the publication of the Expedition. Most of the new species would eventually be described piecemeal by other botanists based on the Expedition's specimens and collections, but not by Sessé or Mociño themselves. would even be published, in Mexico, from the original manuscripts prepared by Sessé & Mociño, followed shorty by the Flora mexicana in 1891. These two posthumous publications would also be without the benefit of any of the fine botanical illustrations many of which had been thought lost after Mociño's death. Much of the Expedition's material finally ended up at the Royal Botanical Garden in Madrid but important parts are still separated, or even lost. Amazingly, a large number of the Expedition's exceptional illustrations, last known to have been with Mociño when he died in Barcelona en route to Madrid from exile in France and long thought lost, resurfaced in 1980 after being missing for well over one hundred and fifty years. They had been ysteriously preserved in the family library of the Torner family in Barcelona. They were not reunited with the main body of the Expedition's archives at the Royal Botanical Garden in Madrid, however, but were instead acquired by the Hunt Institute for Botanical Docu­mentation in 1981and are today located in Pittsburg, Pennsylvania. (Illustrations: 1. 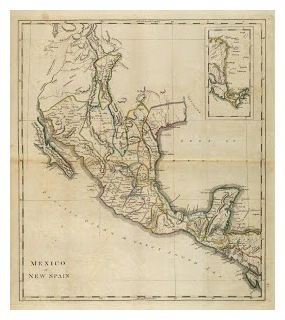 Messico ouvero Nuova Spagna che Contiene il Nuovo Messico la California con una Parte de' Paesi Adjacenti, Antonio Zatta, 1785; 2. Plate 165 from the Torner illustrations showing the exceptional quality of the details; 3. Another plate from the Torner collection of a plant identified as Heliogenus appendiculatus; 4 & 5. 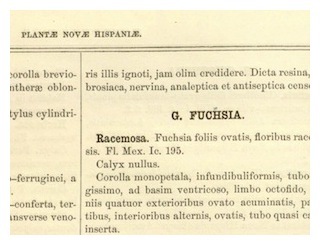 Two details of the fuchsia entries from the 1891 posthumous publication of Flora mexicana; 6. 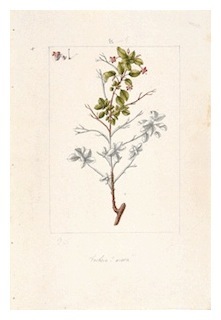 One of the two plates from the Torner collection illustrating F. ovata (F. encliadra). [Royal] Botanical Expedition to the Viceroyalty of Peru – Expedición Botánica al Virreinato del Perú. The Botanical Expedition to the Viceroyalty of Peru was a major effort by the Spanish government to systematically explore the colonial territories of the Viceroyalty of Peru and Chile between 1777 and 1788. The first of three such official expeditions to the Americas (See Royal Botanical Expeditions), it was commissioned by the Spanish king, Charles III, to promote the scientific research of his empire and headed by the botanist Hipólito Ruiz López, with the assistance of the Spanish botanist and pharmacologist José Antonio Pavón y Jiménez and the French botanist Joseph Dombey (until 1784). Two accomplished botanical illustrators, Joseph Bonete and Isidro Gálvez, also accompanied the expedition. Formed at the Royal Botanical Garden in Madrid, the expedition's team left Cádiz in 1777 and arrived in Lima by April 1778. It would explore in the vast territories of the Viceroyalty of Peru (in present-day Peru and Chile), studying and collecting many specimens. 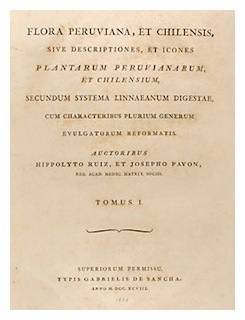 Systema vegetabilium florae peruvianae et chilensis, (Madrid 1798) and the multi-volume Flora peruviana, et chilensis, sive descriptiones (Madrid 1798-1802). Royal Botanical Garden and the Cabinet of Natural History, the precursor of the Museum of Natural History, in Madrid. The discoveries included about one hundred fifty new genera and five hundred new species, many which still bear the names assigned by Ruiz and Pavón. Unfortunately, part of the collection being transported in fifty-three crates containing some eight-hundred illustrations, dried plants, seeds, and other materials was lost when its ship was wrecked on the coast of Portugal. Among the numerous plants first treated by Ruiz & Pavón are a number of fuchsia species still valid today: Fuchsia apetala, F. corymbiflora, F. decussata, F. denticulata, F. ovata and F. simplicicaulis. Other species, such as Fuchsia macrostemma (F. magellanica Lam. 1788), Fuchsia rosea (F. lycioides Andrews 1800) and Fuchsia serratifolia (Ruiz & Pavón 1802) are no longer accepted except as synonyms. See also Pavón; Ruiz; Ruiz & Pavón; Royal Botanical Expeditions. Royal Fuchsia – Common name rarely applied to Fuchsia regia in ➤ Section Quelusia. Royal Horticultural Society Colour Chart – A color chart, in the format of four small hand-held fans of cards each containing four shades of the same color, originally published in 1966 by the Royal Horticultural Society in the United Kingdom. Subsequently republished by the RHS by subscription, and then republished again in 2007, the current chart contains 896 colors on 224 individual cards and can be ordered on the ➤ RHS website. A mini chart that contains 244 colors is also available on the website. See Color Charts. Rub out – To remove the new buds or side shoots along a stem or stalk. New shoots will often be rubbed out as part of a training program to create a standard or tree-shaped plant with all growth atop a tall stem clear of leaves. Rugose – Having a rough or wrinkled surface. Said, for example, of leaves. Similar to bullate (see also), but not quite the same. Ruiz Lopez, Hipólito (1754-1816) – Born in Burgos, Hipólito Ruiz, was a Spanish botanist best known for exploring the flora of Peru and Chile during the Botanical Expedition to the Viceroyalty of Peru, undertaken from 1777 to 1788. After early studies in Latin with an uncle, Ruiz was sent to Madrid at the age of fourteen to continue his education in logic, physics, chemistry and pharmacology. He would study botany at the Migas Calientes Botanical Gardens, now the Royal Botanical Garden, under the tutelage of Casimiro Gómez Ortega (1741–1818) and Antonio Palau Verdera (1734–1793). Ruiz had not finished his pharmacology studies when he was named to head the expedition to Peru commissioned by the Spanish king, Charles III. 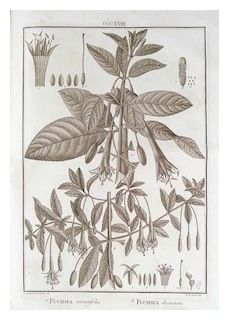 Pharmacologist José Antonio Pavón and the French physician and botanist Joseph Dombey (until 1784), as well as two experienced botanical illustrators, Joseph Bonete and Isidro Gálvez, were selected to assist him. The expedition was a major success and returned to the Royal Botanical Garden in Madrid in 1788 with more than ten thousand engravings, 2,254 botanical drawings with descriptions and numerous other materials. Ruiz, along with Pavón, would publish the results in a number of volumes. Ruiz was named a member of the Royal Academy of Medicine in 1794 and continued to publish various works until his death in 1816. See also Pavón; Ruiz & Pavón; Royal Botanical Expedition to the Viceroyalty of Peru. who produced numerous engraving and paintings of the collections today preserved at the Royal Botanical Gardens in Madrid. 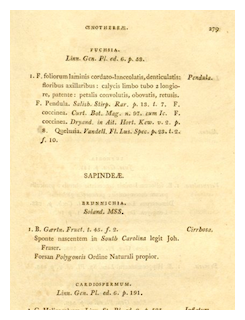 The expedition's work was jointly published by Ruiz and Pavón in Madrid as the Florae peruvianae et chilensis prodromus, (1794), Systema vegetabilium florae peruvianae et chilensis,(1798) and the multi-volume Flora peruviana, et chilensis, sive descriptiones (1798-1802). A portion of their publication includes other collections by the unlucky and querulous Joseph Dombrey (1742-1794), who had also collected on his own and for the French government. His first efforts in South America were captured in shipment by the British in 1780, who sent it as booty to the British Museum resulting in the notorious Dombrey Affair, and half of his own second attempt was seized by Spanish authorities in 1785, under the excuse that colonial work could not be exported to a foreign country, and his illustrations turned over to Ruiz and Pavón for first publication. Among the numerous plants first treated by Ruiz & Pavón are a number of fuchsia species still valid today: Fuchsia apetala, F. corymbiflora, F. deccusata, F. denticulata, F. ovata and F. simplicicaulis. Other species, such as Fuchsia macrostemma (F. magellanica Lam. 1788) and Fuchsia rosea (F. lycioides Andrews 1800), are no longer accepted except as synonyms. Their author citation in scientific publications is Ruiz & Pav. Rust – See Fuchsia Rust. Salicifolia – Having leaves like those of a Salix, or willow; willow-leaved. See Fuchsia salicifolia in ➤ Section Hemsleyella. Salisbury, Richard (1761-1829) – Salisbury was a colorful and controversial English botanist. The precise details of his early career remain somewhat of a mystery but he had apparently studied at the University of Edinburgh under the botanist John Hope. Born as Richard Anthony Markham to a cloth merchant in Leeds, he adopted a new last name in place of his own at some point. According to what he wrote Sir Joseph Banks (see also), it was to please Mrs. Anna Salisbury, an elderly relative of his grandmother, whom he said had settled a large sum of money on him for his schooling. However, Salisbury did have a history of questionable behavior and finances: His wife left him soon after the birth of their only daughter when she found out he had lied to her on their engagement. He was actually in severe debt and would questionably declare bankruptcy after he fell out with her family over her dowry. Whatever the personal truths he was obscuring, his relations with fellow botanists hardy seem much better. He was considered hard to get along with and his strong opposition to the Linnaean System meant that many of his peers ignored his work. He had an especially vehement falling out with his former close friend, Sir James Edward Smith, the founder of the Linnaean Society, over the subject in 1802. Amusingly, the falling out may actually have started over Salisbury's secret attempts to take the straight-laced Smith's 16-year-old protégé, William Drake, to a London prostitute to make him more "manly, &c, &c" and escalated professionally from there. His personal faults and professional feuds aside, Salisbury was actually an accomplished and meticulous botanist who still managed to make important contributions to science. 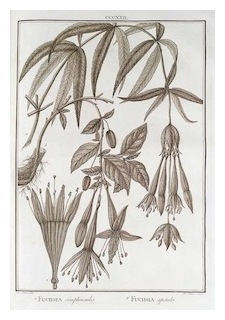 Along with a number of articles and four works published in his own name, he was also the hidden author of the extensive botanical revisions in On the cultivation of the plants belonging to the natural order of Proteeae published in the name of a friend, Joseph Knight, in 1807. 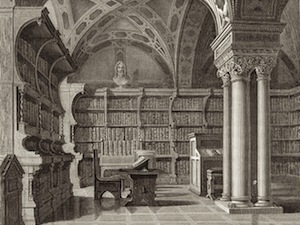 Unfortunately, Salisbury was accused of preempting and plagiarizing much from Robert Brown, with whom he was also at odds, after a reading Brown gave at the Linnean Society and before Brown could publish his work in a paper. Salisbury was roundly denounced and ostracized. Samuel Goodenough, the bishop of Carlisle and an amateur botanist himself, wrote, "How shocked was I to see Salisbury's surreptitious anticipation of Brown's paper on New Holland plants, under the name and disguise of Mr. Hibbert's gardener!" Much earlier, in his Icones stirpium rariorum of 1787, Salisbury described and renamed Aiton's Fuchsia coccinea as Fuchsia elegans reasoning that its bright red color wasn't a sufficiently distinctive trait for a fuchsia to warrant that specific epithet. Probably aware of Domenico Vandelli's (see also) work on Portuguese and Brazilian plants, Salisbury also stated that it had been introduced by him. This was, of course, in opposition to the confused report by Aiton (see also) that this Brazilian plant had been brought to Kew from Chile by a certain Captain Firth (see also). In Prodromus stirpium in horto ad Chapel Allerton vigentium, the 1796 catalogue and description of plants growing in the garden he established at his father's estate at Chapel Allerton near Leeds, Salisbury published F. coccinea again but this time as Fuchsia pendula. 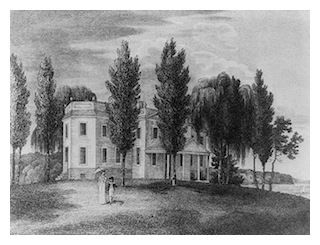 By 1802, Salibury's finances had apparently regularized enough so that he was able to purchase Rigdeway House at Mill Hill where he established another garden. Later he moved to London where he was reported to have kept several hundred rare plants in a tiny garden only about thirty square feet in size. Today his papers are at the British Museum and his herbarium at Kew. Sanctae-rosae – From the Department of Santa Rosa, Bolivia. See Fuchsia sanctae-rosae in ➤ Section Fuchsia. Sanctos-limae – Named in honor of the Brazilian botanist, Santos Lima. Fuchsia sanctos-limae (Brade 1957) is a synonym of F. glazioviana (Taub. 1892) in ➤ Section Quelusia. Sanmartina – From the Department of San Martín, Peru. See Fuchsia sanmartina in ➤ Section Fuchsia. Scabriuscula – Having smallish, slightly rough leaves. See Fuchsia scabriuscula in ➤ Section Fuchsia. Scandens – Climbing or sprawling. Fuchsia scandens (E.H.L.Krause 1905) is a synonym of Fuchsia decussata (Ruiz & Pav. 1802) in ➤ Section Fuchsia. Scarlet Fuchsia – Common name occasionally applied to F. coccinea in ➤ Section Quelusia. Graptophyllum excelsum is also sometimes referred to as "Scarlet Fuchsia" in its native Australia (see ➤ Section Fuchsia). Scherff, Fritz de (1847-1896) – Fritz de Scherff was a well-connected nobleman from Luxemburg who accompanied Édouard André (see also) on part of his exploratory trip to South America in 1875-1876. The twenty-eight year old de Scherff had come along on the expedition not as a botanist or naturalist but simply as a tourist. The natural rigors of the trip were apparently not to his expectations and he amicably parted company from the group with a warm handshake, as André reports, to return to Quito. He would not be seen again by André until eighteen months later in André's salon in Paris. Nonetheless, André did still describe Fuchsia scherffiana in his honor in 1888. Though perhaps not without more than a passing nod to his father, the important Luxemburg politician and minister, Paul de Scherff. The original collection of this relatively rare species was likely made for André in southern Ecuador by the Belgian Hugo Poortman a couple of months after André returned to Europe in September 1876. See F. scherffiana in ➤ Section Fuchsia. 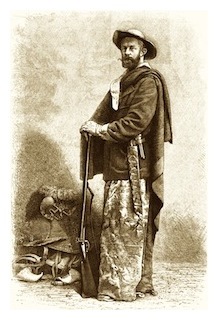 (Illustration: Portrait of Fritz de Scherff posed as an explorer in exotic costume. Engraving by E. Ronjat in Charton, Édouard. Le tour du monde - nouveau journal des voyages - livraisons n°1169,1170,1171,1172 et 1173 - L'Amérique équinoxiale par Ed. André,voyageur chargé d'une mission du gouvernement français (1875-1876). Scherffiana – Named in honor of Fritz de Scherf (1847-1896). See: Scherf; F. scherffiana in ➤ Section Fuchsia. Schnabel, Clement (1906-1993) - American hybridizer from San Francisco, California. Among his plants are 'Portola' (1947), 'American Festival,' 'Bo Peep' (1948), 'Debutante,' 'Neon,' 'Parkside' (1949), 'Bernadette,' 'Cameo,' 'City of Portland' (1950), 'Picotee,' 'Rose Mauve,' 'Silvia,' 'Stella Marina' (1951), 'Dorothy Louise,' 'Emma O'Neill,' 'Gaiety,' 'Mel Newfield,' 'Snow Flurry,' 'Violetta' (1952), 'Dainty Damosel,' 'Cavalier,' 'Vagabond' (1953), 'Avalanche,' 'King's ransom,' 'Sleigh Bells,' (1954), 'Burgundian,' 'Pink Parfait,' 'Plum Glory,' 'Rose Chiffon,' (1955), City of Richmond,' 'Stop Lite' (1956), 'Cara Mia,' 'Granada' 'Impudence' (1957), 'Major Barbara,' 'Pearl Lustre,' (1958), 'Hazel Marsh,' 'Pompadour,' 'Shalimar,' 'Ting-a-Ling' (1959), Jinx' (1960), 'Niagara,' 'The Franciscan,' 'Tutti Fruiti' (1961), 'Embarcadero,' 'Valencia,' 'Vanity Fair' (1962), 'Alaska,' 'John Marsh,' 'Mandarin,' 'Tahiti' (1963). Schneevogt, George Voorheim (1775-1850) – Schneevoogt (more properly Voorhelm Schneevoogt) was a Dutch botanist and gardener who owned the famous Voorhelm and Schneevoogt nursery at Haarlem in the Netherlands. He provided the descriptions for a beautifully illustrated botanical work, Icones plantarum variorum, published in 1793, with each entry in Latin, Dutch, French and German. Nahusia coccinea (Schneevoogt 1793) is sometimes reported as a synonym of Fuchsia magellanica (Lam. 1788) in ➤ Section Quelusia. However, it is a synonym of Fuchsia coccinea (Aiton 1789). Schneevoogt established Nahusia as a new genus for that name in Icones plantarum rariorum with the reasoning that the plant in question does not accord closely with the descriptions of Fuchsia by Linnaeus and other writers in his opinion. While he states Nahusia is native to "Chili", the accompanying illustration and description more closely line up with Fuchsia coccinea than Fuchsia magellanica and he does state that it is easily cultivated in a warm greenhouse as well. There is much early confusion between the two species. See Nahusia. Schufia – Fuchsia sect. Schufia. Judging from the way botanists usually devise new names, one would think that Section Schufia, one of the twelve into which the genus Fuchsia is divided, was named to honor a famous and eminent botanist by the name of Schufe. Or maybe it was intended as a nod to an intrepid plant collector, some noble and adventurous Freiherr von Schuf, who braved poisonous three-eyed snakes and pesky banditos in the jungles of Central America to bring it home? The director of a botanical garden? A German garden hoe, the Schuffel? Guess again. Sometimes taxonomy gets complicated. Other times, it gets a giggle. A polite one, of course, but a giggle none-the-less. Possibly, later, even a few tears as well. Occasionally it gets all three. 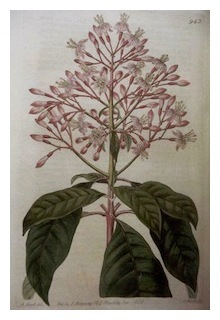 In 1826 the English botanist and editor of Curtis's Botanical Magazine, John Sims (1749-1831), described an interesting new fuchsia discovered in Guatemala as F. arborescens because it was so unusually large it seemed to him like a tree. The French-Alsatian botanist Édouard Spach (1801-1879), thinking that Fuchsia arborescens's lilac-like panicles made it quite unlikely to be so closely related to Fuchsia, created a new monospecific genus, Schufia in 1835, and removed arborescens there. 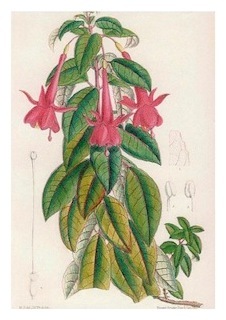 The Austrian botanist, Stephan Endlicher (1804-1849), clearly saw the connection, though, and put it right back into Fuchsia in 1840. After that, Fuchsia arborescens had a variety of formal adventures until 1943 when Phillip Munz (1892-1974) decided to just be done with it all and reorganized the whole mess the genus had become. Unbeknownst to them all, the first Fuchsia arborescens had already been collected as Fuchsia arborea by the celebrated botanists José Mariano Mociño and Martín de Sessé y Lacosta during the legendary Royal Botanical Expedition to New Spain that took place between 1787 and 1803. 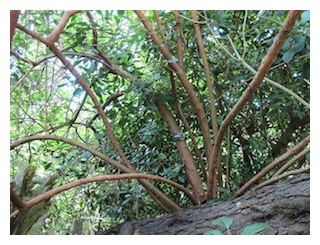 They had even planted a specimen in the Royal Botanical Garden in Mexico City. Unfortunately, the final results of that great botanizing expedition languished in Spain, unpublished and mostly forgotten because of politics and war and the regal apathy of kings, until it was too late. 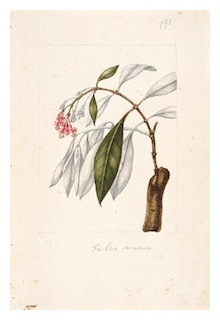 Even the spectacular illustration of Fuchsia arborea done in the field would become lost until a significant portion of the Expedition's paintings, missing for over a century and a half, unexpectedly turned up again in 1980, preserved in a private family library in Barcelona. Spach himself was to be honored in Spachia fulgens by the Swedish botanist Nils Lilja(1808-1870) in 1840. Spachia quickly became Ellobium by the very same Lilja in 1841. But then the French botanist, Élie-Abel Carrière (1818-1896) decided that it, too, was really a Fuchsia and so, voilà, it became Fuchsia fulgens in 1881. However, Fuchsia fulgens had again first been collected by Sessé & Mociño, but this time validly published in Switzerland by Auguste-Pyrame de Candolle in 1828. He had based his diagnosis on the expedition's illustrations temporarily lent to him by a now-decrepit Mociño while he was in French exile from 1812-1820, and before Mociño died, impoverished and blind, of a cerebral hemorrhage probably brought on by heartbreak and disappointment, after which most of the illustrations disappeared until recently. So, who's on third? Maybe this mysterious Schufe? No, not really. No one is, in fact. 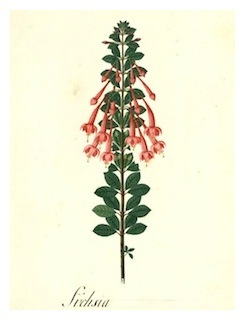 Uncharacteristically for a botanist, Spach seemed quite at a loss for new names at precisely the very moment he needed to create one; Schufia is simply a bad anagram of Fuchsia. The odd jumble was revived for Fuchsia sect. Schufia, which includes only two species Fuchsia arborescens and Fuchsia paniculata (Lindley 1856). Scientific Nomenclature – See Nomenclature. Section – A sub-division of a genus, a section is a grouping of species sharing similar characteristics. Botanists have divided Fuchsia into twelve sections: Ellobium, Encliandra, Fuchsia (which contains the type species for the genus), Hemleyella, Jimenezia, Kierslegeria, Pachyrizza, Procumbentes, Quelusia, Schufia, Skinnera and Verrucosa. See also ➤ Fuchsia Species. Seeds – Most garden fuchsias are complex hybrids and won't come true from seed. They're easy propagated from cuttings, though, so there's little point to seed-grown plants outside of curiosity or hybridizing. The resulting seedlings usually wouldn't produce much of anything interesting or desirable, anyway, and even intentional hybridizers might cull through hundreds of targeted crosses before getting the one plant with characteristics worth keeping. The number of seeds in fuchsia berries is variable. Depending on the species or cultivar, a berry can contain anywhere from a couple of dozen to hundreds. Seler, Eduard Georg (1849-1922) – See Seleriana. Seleriana – Named in honor of Eduard Georg Seler (1849-1922). Active around the turn of the twentieth century, Seler was a prominent German anthropologist, ethnohistorian, linguist, epigrapher and academic, who was regarded as one of the most influential scholars in the field of pre-Columbian cultures in Mesoamerica during that period. Fuchsia seleriana (Loes. 1913) was collected by him on a field trip to Guatemala in 1896 and published by Theodor Lösener (1865-1941), a German botanist at the Botanic Garden and Botanical Museum Berlin-Dahlem, as a new species in Verhandlungen des Botanischen Vereins der Provinz Brandenburg (55: 79, 1913). Fuchsia seleriana Loes. is a synonym of Fuchsia encliandra subsp. tetradactyla (Lindl.) Breedlove in section ➤ ;Encliandra. See also ➤ California Academy of Sciences. Self-colored – Fuchsia blossoms in which both the sepals and corolla are of the same or nearly the same color. Selfing– The process in which the stigma is pollinated with pollen either from the same plant, or from a plant of identical genetic make-up. Semi-double – Cultivated fuchsias with five to eight petals to the blossom. In nature, fuchsias have four petals. Some have none. See also, Single, Double. Semi-ripe Cutting – Cuttings taken from plants in the summer when the stems have started to become ripe and the plant is in flower. These are often taken from the mother plant with a "heel" attached. Semi-trailer – A fuchsia with an intermediate habit between lax, hanging growth good for growing in baskets and upright growth for pots or in the ground. With a little training, semi-trailers will often be adaptable to either format. Semperflorens – Always flowering, Fuchsia × semperflorens (Rozain 1888) is an unresolved name or synoymn. Sepal – The outermost part of the flower. Along with the tube, or hypanthium, it forms the calyx. Serrae – Referring or belonging to the serras, or mountain ranges, of Brazil. Specifically in Fuchsia regia subsp. serrae, to the steep coastal escarpments of the Serra do Mar and Serra Geral ranges in Rio Grande do Sul, Santa Catarina, Paraná, São Paulo and southern Rio de Janeiro States, to which it is native. (In other references, the genitive might possibly be used to honor someone with the last name of Serra but that is not the case with Fuchsia.) While etymologically related, serra is also the word for a saw in both Latin and Portuguese but is not to be confused with the botanical term serrata, serrate or saw-like, as said of leaves having a margin of forward pointing teeth or a notched or saw-like edge. See Fuchsia egia subsp. serrae in ➤ Section Quelusia. Serratifolia – Having margins on the leaves resembling the teeth of a saw. Fuchsia serratifolia (Ruiz & Pav. 1802) is a synonym of Fuchsia denticulata (Ruiz & Pav. 1802) in ➤ Section Fuchsia. Sessé y Lacasta, Martín (de) (1751-1808) – Spanish botanist and physician who headed the ➤ Royal Botanical Expedition to New Spain to study and classify the flora of the vast Spanish territories that included today's Mexico. Sessé was born in Baraguás in Aragón in 1751. Having finished his training in medicine at the Hospital de Nuestra Señora de Gracia de Zaragoza, the young physician left for Madrid in 1775. In 1779 he became a military doctor working at Great Siege of Gibraltar. It was in that military capacity that he was to be posted to Cuba and the West Indies for the next four years, before finally settling himself in New Spain. By 1785 Sessé was practicing in Mexico City at the Hospital del Amor de Dios and had a number of influential patients. Soon devoting himself entirely to botany, however, Sessé proposed the establishment of a new botanical garden and an expedition to study New Spain's botanical riches to the reform-minded Viceroy of New Spain, Juan Vicente de Güemes (1740-1799). At that time most of the plants and animals of Mexico were virtually unknown to science. In 1786 the like-minded reformist Spanish king, Charles III, officially authorized the colossal scientific effort on the model of previous expeditions that were being undertaken in the Viceroyalties of ➤ Peru and ➤ New Granada in South America. In 1788, Sessé was appointed head of the botanical garden he established in Mexico City and would direct teams of botanists, collectors, and artists who fanned out through the vast territories in several exploratory trips from 1787-1803. At the project's conclusion in 1803, Sessé, along with another leading member of the expedition, the Mexican-born and trained botanist and doctor, José Mariano Mociño, returned to Spain with the scientific collections to work on the publication of a grand Flora Mexicana. Among those collections are several fuchsias, such as Fuchsia ulgens [as F. racemosa] and Fuchsia arborescens [as F. arborea]. Unfortunately, they meet with a troubled political climate in Spain and disinterest from the new regime of Charles IV in Madrid. Sessé died disappointed to see the ground-breaking work still left unpublished in 1808. Most of the discoveries were left to be described piecemeal by other scientists. It wasn't until many decades later in 1889 that Plantae novae hispaniae would even be published in Mexico from the original manuscripts prepared by Sessé and Mociño. It was followed shorty by Flora mexicana in 1891. The scientific collections of about 7,100 specimen sheets with 200 genera and 3,500 new species of plants are today incorporated into the herbarium at the Royal Botanical Garden of Madrid. The main trove of the expedition's 1,400 exceptional botanical drawings, long thought lost after Mociño's death in 1820, were rediscovered in a private library in Barcelona in 1980. They were purchased by the Hunt Institute in 1981, where they are available for study. The genera Sessea and Sesseopsis were named in Sessé's honor. See also ➤ Mociño, ➤ Royal Botanical Expedition to New Spain. Sessilifolia – Having unstalked, petioled leaves. See Fuchsia sessilifolia in ➤ Section Fuchsia. Shaping – Training a plant, especially to a particular form or specimen such as a standard or pyramid, by selectively pinching or rubbing out shoots or forcing a particular direction of growth. Ordinary plants in pots and baskets are also shaped to increase their flowering and obtain a more symmetrical form. The practice might also be termed training. Ships – See USS Fuchsia; M919 Fuchsia. Shrub – A woody plant smaller than a tree tree and which usually has several stems growing from the same base; a bush. Siphonantha – With tubed flowers. Fuchsia siphonantha (E.H.L.Krause 1905) is a synonym of Fuchsia denticulata (Ruiz & Pav. 1802) in ➤ Section Fuchsia. 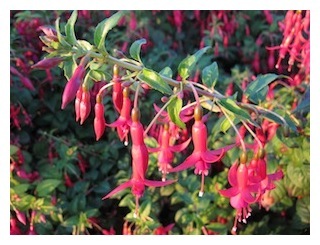 Silver Dale Nurseries National Collection of Fuchsia Species & Cultivars – See National Collections (UK). Simplicicaulis – Having an unbranched stem. See Fuchsia simplicicaulis in ➤ Section Fuchsia. Skelton, Robin (1925-1997) – See Popping Fuchsias. Skinner, Rev. Richard (1729?-1795) – Skinner, an English botanist, graduated from Oxford in 1753 and was the rector of Bassingham in Lincolnshire from 1774. He was well known in the botanical circles of his time and was a friend of Forster & Forster (see also), who named Skinnera excorticata for him in 1776, as well as of Joseph Banks (see also). Unfortunately for the honor, Skinnera excorticata, a plant actually already collected in New Zealand by Banks & Solander in 1769 but never validly published, was moved to Fuchsia when Carl Linnaeus the Younger recognized the connection in 1781. 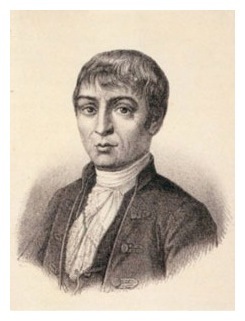 The Swiss botanist, Augustin Paramus de Candolle (1778-1841), however, revived Skinnera as the name of one of the two sections into which he divided the genus Fuchsia in 1828. The name is sometimes seen incorrectly rendered as Skinneria. See ➤ Section Skinnera. Skinnera – Named in honor of the Reverend Richard Skinner (1729?-1795). See: Skinner; ➤ Section Skinnera. Skutchiana – Named in honor of Alexander F. Skutch (1904-2004), an American botanist, ornithologist and naturalist and philosopher. He was noted for his numerous publications and books on Central America, especially on its birds. He lived in Costa Rica since he purchased a farm there in 1941 and collected plants for sale to Museums. An avowed naturalist and vegetarian who believed in "treading lightly on the Mother Earth", Skutch's farm remained without running water until 1990. Fuchsia skutchiana (Munz 1943) is an unresolved name or synonym. Sloane, Sir Hans (1660-1753) – Sloane was a noted British physician, botanist and collector of curiosities. He had studied medicine in London and then France, where he was a pupil and eventual friend of Joseph Pitton de Tournefort (1656-1708), the professor of botany at the Jardin du Roi in Paris (now the Jardin des Plantes). Tournefort had also been Charles Plumier's teacher. In 1687, Sloane accompanied the new governor of Jamaica, the 2nd Duke of Albermarle, to the island as his personal physician. The Duke died of drink shortly after his arrival but Sloane stayed to collect plants in Jamaica and other Caribbean islands until 1689. His many discoveries were published in 1696 after he had returned to England. Much later, Sloane also released an important journal of his Caribbean experiences. Sloane and Plumier never had the chance to meet but they knew and admired each other's work; Plumier even dubbed a new genus Sloanea. 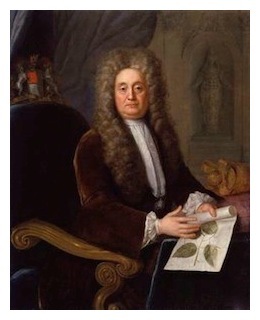 Widely celebrated in his time, Sloane succeeded Sir Isaac Newton as president of the Royal Society and was the first physician to be honored with an hereditary title (baronet in 1716). He donated the grounds for the Chelsea Physic Garden, helped found London's Foundling Hospital, and his extensive collections and library formed the core of the new British Museum in 1759. He's also noted for having invented chocolate milk after he found the cocoa and water mixture to which he was introduced in Jamaica unpalatable. Volume 8 of his herbarium, now in the Natural History Museum, preserves the first known actual fuchsia specimen. It was collected for him by George Handisyd in the Tierra del Fuego just before July 1690 (ff. 128, 105.6, 148 3). The accompanying note in Sloane's own hand reads, "This Mr. Handisyd gathered in the streights of Magellan. It bears a figg as he told me which was eatable on it fed blackbirds it grew to the heighth of a small tree, it had a green bark & brittle wood." Unfortunately, this Fuchsia magellanica specimen remained unpublished. Unfortunately, as well, it's also in the only volume of Sloane's herbarium still not published in facsimile on the Natural History Museum's website. Smith, Lyman (1904-1997) – Smith was an American botanist who concentrated on the taxonomy of the flowering plants of South America, in particular the Bromeliaceae, Begoniaceae and Velloziaceae families. He was a curator in the Smithsonian Institution's Department of Botany from 1947 until his retirement in 1974. However, he remained active at the United States National Herbarium as a curator emeritus almost until his death. Fuchsia smithii (Munz 1943) is now synonymous with Fuchsia petiolaris. See Fuchsia petriolaris in ➤ Section Fuchsia. Smith, Matllda (1854–1926) – A leading British botanical illustrator whose work appeared in Curtis's Botanical Magazine. For well over forty years, between 1878 and 1923, Smith produced over 2,300 plates for the magazine and other publications. She also become the first official botanical artist of the Royal Botanic Gardens at Kew, where she made reproductions for the library. In 1921 she became an Associate of the Linnean Society (1921), only the second woman to be appointed to that level of its membership. The plant genera, Smithiantha and Smithiella, were named in her honor. Among her drawings are, of course, several fuchsias. Smithii – Named in honor of Lyman B. Smith (1904-1997). Fuchsia smithii (Munz 1943) is now synonymous with Fuchsia petiolaris. See: Smith; Fuchsia petriolaris in ➤ Section Fuchsia. Societies – See ➤ Fuchsia Societies for a full list. Song of the Fuchsia Fairy – See Fuchsia Fairy. Soft Cuttings – Cuttings taken from new shoots. If the cutting material is long enough, it can be further divided to produce a tip cutting, an internodal cutting, a split internodal cutting and a basal cutting. Spach, Édouard (1801-1879) – French-Alsatian botanist. Spachia fulgens (Lilja 1840) is synonymous with Fuchsia fulgens (De Candolle 1828, Carrière 1881), as is another invalid synonym Ellobium fulgens (Lilja 1841). See Fuchsia fulgens in ➤ Section Ellobium; and also see Ellobium, Fulgens. Spachia – Named in honor of the French-Alsatian botanist, Édouard Spach (1801-1879). Spachia fulgens (Lilja 1840) is synonymous with Fuchsia fulgens (De Candolle 1828, Carrière 1881), as is another invalid synonym Ellobium fulgens (Lilja 1841). See: Spach; Fuchsia fulgens in ➤ Section Ellobium; Ellobium; and Fulgens. Species – A group of consistently similar individuals with common characteristics capable of inter-breeding. Species form one of the main taxonomic units of botany. They are directly under a genus and, since Linnaeus, are identified by a Latin binomial. For example, Fuchsia magellanica, is a species. According Article 23.1 of the current ➤ International Code of Nomenclature (Melbourne Code, 2011), "The name of a species is a binary combination consisting of the name of the genus followed by a single specific epithet in the form of an adjective, a noun in the genitive, or a word in apposition, or several words, but not a phrase name of one or more descriptive nouns and associated adjectives in the ablative (see Art. 23.6(a)), nor any of certain other irregularly formed designations (see Art. 23.6(b–d)". Speciosa – Showy, spectacular. Fuchsia speciosa Hort. (ex Bailey 1900) is a synonym of Fuchsia hybrida Hort. (ex Siebert & Voss 1894), which is itself an unresolved name. Spectabilis – Spectacular. Fuchsia spectabilis (Hook.1848) and Fuchsia spectabilis var. pubens (I.M.Johnst. 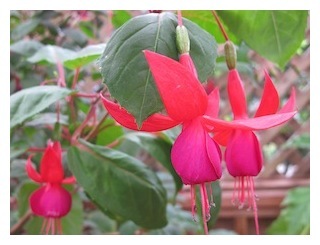 1925) are both synonyms of Fuchsia macrostigma (Benth. 1844) in ➤ Section Fuchsia. Spelling – See Fuchsias in all the Languages of the World. Spinosa – Having spines. Fuchsia spinosa (C.Presl. 1831) and F. rosea var. spinosa (C.Presl) Reiche 1897) are both synonyms of Fuchsia lycioides (Andrews 1800) in ➤ Section Kierschlegeria. Splendens – Splendid. See Fuchsia splendens in ➤ Section Ellobium. Sport – A shoot spontaneously appearing on a plant which is distinctive in characteristics such as growth habit, leaf color, variegation or flower color from the rest of the plant. Sports will not come true from seed so must be propagated vegetatively to maintain any desirable traits. Some sports are unstable and propagated plants will often show reversions that must be removed. Stamen – The stamen (plural stamens, or stamina in Latin) is the pollen producing reproductive organ of a flower. Stamens usually consist of a stalk called the filament at the end of which is a sac-like structures called an anther where the pollen is produced. Fuchsias typically have eight stamens which often extend beyond the flower rim. Staminate Flowers – Male flowers in which the female reproductive parts are absent or reduced to sterility. See also Breeding Systems. Standard – A fuchsia that has been trained into a "tree" shape with a head of leaves and flowers at the top of a section of clear stem of varying height meant to mimic a trunk. While side shots are usually rubbed out along the stem, the leaves are left on until the head has been fully developed by pinching. 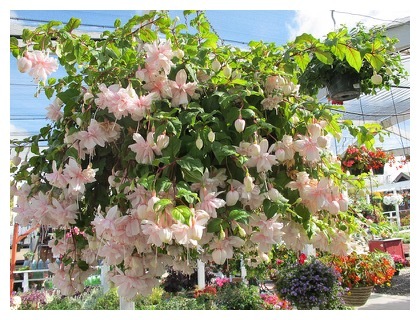 This is a particularly effective way of training and displaying many trailing cultivars as specimens or for places where hanging baskets can't easily be suspended. Standishii – Fuchsia × standishii (Paxton 1844) is an unresolved name or synonym. Steinbachii – Named in honor of José Steinbach (Joseph Steinbach Kemmerich, 1875-1930), a German explorer and collector, who settled permanently in Bolivia in 1904. His many plant and animal collections were sold to museums and universities around the world and some thirty species came to be named in his honor. Perhaps twenty-nine; Fuchsia steinbachii (I.M.Johnst. 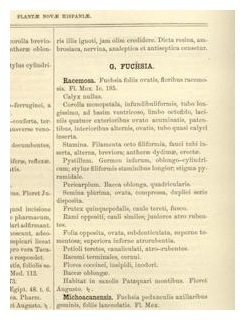 1925) is now a synonym of Fuchsia juntasensis (Kuntze 1898) in ➤ Section Fuchsia. Stevens, Col. John (1749-1838) – Stevens was a American politician, lawyer, engineer and inventor who grew the first fuchsia recorded in the United States about 1797 at Villa Stevens at Castle Point in New Jersey. His large estate included most of the modern city of Hoboken just across the Hudson River from lower Manhattan. It's not known exactly from where he obtained his fuchsia but the prominent Stevens family had extensive interests in mercantile shipping. Stevens, an avid gardener, frequently had his agents in England ship him interesting plants. The actual species isn't noted in his records but it's likely to have been either Fuchsia coccinea or Fuchsia magellanica. 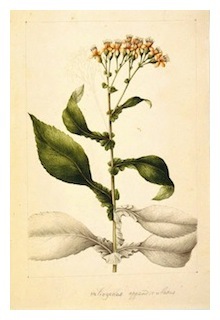 He also engaged in an lively exchange of rare plants, including the fuchsia, with a number of prominent collectors such as his brother-in-law, Robert Livingston (1746-1813), one of the drafters of the Declaration of Independence and first Chancellor of New York, among his many other accomplishments, and Dr. David Hosack, founder of the Elgin Botanic Garden in 1801, the first in the United States. Today the core of the estate lies buried under the Stevens Institute of Technology, founded in 1870 by a bequest of Col. Stevens' son, Edwin, at his death in 1868. Steyermark, Julian A. (1909-1988) – Venezuelan-born American botanist. Steyermark's career included the Field Museum of Chicago, the Jardín Botánico de Caracas of the Universidad Central of Venezuela and, finally, the Botanical Gardens in St. Louis, from 1984 until his death. His major publications were Flora of the Venezuelan Guayana, Flora of Guatemala and Flora of Missouri. He was a prolific collector and the over 130,000 plants collected in twenty-six countries even earned him a mention in the Guinness Book of World Records. In all, Steyermark made initial descriptions of 2,392 taxa, including one family, 38 genera, and 1,864 species. The genus Steyermarkia was named for him. See Fuchsia steyermarkii in ➤ Section Fuchsia, a new species which was he collected and which was described in his honor. 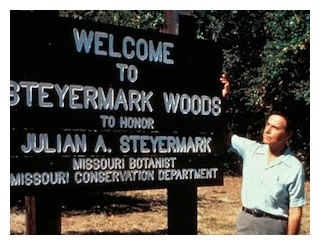 Steyermarkii – Named in honor of the distinguished Venezuelan-American botanist, Julian A. Steyermark (1909-1988). See: Steyermarck; Fuchsia steyermarkii in ➤ Section Fuchsia. Stigma – The part of the flower at the end of the pistil to which the pollen grains adhere. Stipules – Small leaf-like growths occurring in pairs at the base of a leaf or leaf stalk. Stolon – A shoot that grows along the ground producing roots and new branches from its nodes; a runner. See Rhizome, Tuber. Stoloniferous – Producing stolons or suckers. Stoma – Minuscule epidermal pore in the leaf or stem of a plant which allows the passage of gases and water vapor. Stopping – Also called pinching. The removal of the growing tip of a branch. Stopping or pinching will encourage side buds to break from the leaf axils and result in a bushier, more floriferous plant. A plant will often be stopped or pinched several times before it's left to flower for the season. Storkii – Named in honor of the American botanist, Harvey E. Stork (1890 -1956). Stork joined the faculty of Carleton College in Northfield, Minnesota as a professor of botany in 1920 and remained there until retirement in 1955. His summers, however, were spent on plant hunting expeditions primarily to South America and his collections are represented in a number of American institutions. Interestingly, Stork spent 1927 and again during 1929-1931 as a seasonal ranger naturalist at Yellowstone Park documenting and photographing plants and animals in the Park before later returning to his usual habit of trips to South America. Fuchsia storkii (Munz 1943) is a synonym of Fuchsia mathewsii (J.F.Macbr. 1940) in ➤ Section Fuchsia. Striking – Rooting cuttings by inserting them into a suitable rooting medium. Striolata – Striolated or grooved. Fuchsia striolata (Lundell 1940) is an unresolved name or synonym. Stubbs, Annabelle (1913-2003) – American nursery owner, hybridizer and tireless fuchsia promoter from California. Relocating several times along the California coast with her husband, Bud, Annabelle Stubbs seems to have opened a fuchsia nursery or fuchsia garden or local fuchsia society where ever they landed. 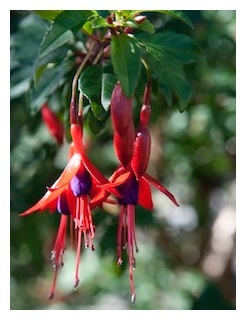 First came the Stubbs Fuchsia Nursery at Leucadia in southern California. This was followed by Annabelle's Fuchsia Gardens at Fort Bragg on the northern California coast in the early 1970s, where she also helped found the local branch of the American Fuchsia Society. Returning to Oceanside in southern California because of the ill health of her sister, she opened Fire Mountain Fuchsias at her home. While there, she was also one of the forces behind the beautiful, but unfortunately now-defunct, fuchsia garden created in a seemingly inhospitable, arid canyon at the San Diego Wild Animal Park near Escondido. Next came a move to a greenhouse in Eureka, back again on the northern coast, before both Stubbs finally landed at Vista, once more in southern California, towards the end of their lives. Through all the wanderings, Annabelle Stubbs also crossed fuchsias. Inspired by fellow California hybridizer, Roy Walker, she managed the amazing feat of releasing seventy-three new hybrids between 1970 and 1997. With a sure and artistic eye in the selection of parents, her plants were especially noted for their well-formed corollas and pastel shades. Along with 'Blue Pinwheel,' her first release in 1970, are such note-worthies as 'Strawberry Fizz' (1970), 'Taffeta Bow' (1972), 'Mendocino Rose' (1976), 'Applause' (1978), 'Fire Mountain' (1980), 'Blue Halo' (1981), 'Malibu Mist' (1985), San Pasqual' (1986), 'Oriental Flame' (1987), 'Pink Parasol' (1989) and 'Frank Sanford' (1992), with 'Jenessa' being her final introduction in 1997. 'Pink Marshmallow,' registered in 1971 and one of her earliest crosses, has easily and justifiably gone on to become one of the most popular fuchsias in the world. Style – The stalk of the female parts of the flower. Subfamily – A taxonomic rank in botany just below a family but above a tribe or genus. See Onagraceae. Subshrub – A low-growing shrub or perennial with a woody base. Subspecies – Naturally occurring populations within a species' geographic distribution sharing some characteristics that are distinctive enough to warrant formal designation but not so much so that they should form a separate species. Subspecies are considered capable of easily hybridizing but rarely do because of isolation or other factors. Some species such as F. magellanica are variable and mixed throughout their range and the differing individuals can't truly be considered subspecies. The standard abbreviation is subsp. but the shorter alternative ssp. is occasionally used as well. Summa – From the top, the uppermost or highest point or place, the summit. See Fuchsia summa in ➤ Section Fuchsia. Surian, Joseph Donat (1649-1691) – French physician and apothecary from Marseille who was sent by Michel Bégon (see also) to botanize in the West Indies in 1689 at the behest of Louis XIV's government. Charles Plumier (see also) was engaged to accompany Surian on the expedition through Martinique and St-Domingue (Haiti) which lasted until the beginning of 1690. Surian collected many specimens which were then drawn and noted by Plumier. His collections are today housed in ten bound volumes at the Muséum national d'histoire naturelle in Paris, and are well represented within the Jussieu Herbarium located there as well. Unfortunately, many of Surian's collections are poorly preserved and useless for study were it not for Plumier's meticulous drawings to aid in identification. Despite what was apparently a very contentious relationship on the notoriously ill-tempered Surian's part, one that even cut their trip short, Plumier named the genus Suriana after him. Plumier would later return to the Caribbean on two more expeditions as a Royal Botanist. But without Surian. Surian would meet an unfortunate demise back in Marseille, shortly after his return from the Caribbean, seemingly through his own stupidity. He accidentally poisoned himself, his wife, two children and a maid, with a strong and lethal purgative made from herbs that he had collected. 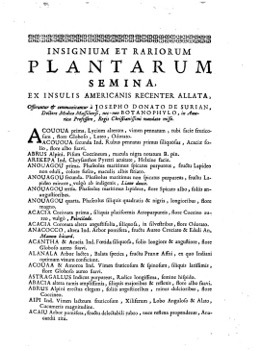 Insignium et rariorum plantarum semina ex insulis americanis recenter allata offeruntur et communicantur a Josepho Donato de Surian was published posthumously as an undated plant list, perhaps in 1712, a year sometimes incorrectly give for his death. Swingtime – A large-flowered trailing cultivar produced by lHorace Tiret (see also) in California in 1950. With it beautiful double red-and-white flowers and easy cultivation, the floriferous Swingtime could easily take the designation of the world's most popular and emblematic fuchsia. In fact, you would be hard-pressed to find a nursery without a basket or two especially in the springtime. Sylvatica – From the forest; of the forest. See Fuchsia sylvatica in ➤ Section Fuchsia. Sympatric – Occurring in the same or overlapping areas but not usually interbreeding. This might be due to differences in pollinators or flowering periods. Synonym – A duplicate taxonomic name that has been rejected or replaced and is now invalid. Unlike the general definition of the word, a taxonomic synonym in botany is not interchangeable with the name of which it is a synonym and cannot exist in isolation. Synonyms can be created when the same taxon is independently described or named more than once. They may also be created whenever an existing taxon is changed. For example, when a species is moved to a different genus or two genera are joined to become one. Among the many synonyms for the genus Fuchsia are Brebissonia, Ellobium, Encliandra, Kierschlegeria, Kirschlegera, Lyciopsis, Myrinia, Nahusia, Quelusia, Quiliusa, Schufia, Skinnera, Spachia, Thilcum and Tilco. See The Plant List. 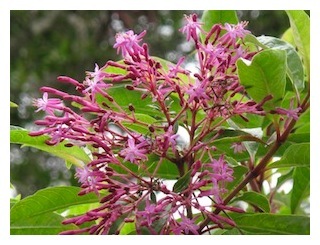 Syringiflora – Having flowers resembling those of Syringa, or the lilac. Fuchsia syringiflora (Carrière 1873) is a synonym of Fuchsia arborescens (Sims 1826) in ➤ Section Schufia. Systemics – Insecticides or fungicides that are absorbed into a plant through watering the roots or spraying the leaves. Since systemics make the plant itself poisonous to insects or fungus, care should be taken not to eat berries, flowers or leaves from plants that have been treated in this way.